Did you know only 26% of nonprofit organizations can say they have a sophisticated business content plan? This is because not-for-profit organizations face one of the biggest marketing challenges: scarce funding. However, in many cases, these organizations are also equipped with an important strength — passion for fulfilling their mission. Nonprofit marketers are driven by the desire to make the world a better place, and creating real change is of the utmost importance to them. This is why digital marketing for nonprofit organizations is crucial. Targeted efforts to promote their goals will help them thrive and raise more awareness, as well as attract more funding for their mission. How do you promote a nonprofit organization? To promote a nonprofit, you need branding and marketing that reaches your target audience with the right message at the right time. There are many channels you can use, including content marketing, print ads, video campaigns, emails, online ads, organic and paid social media content, and more. According to Skills Platform, the lack of funding and the lack of skills create almost equal obstacles to organizational growth. 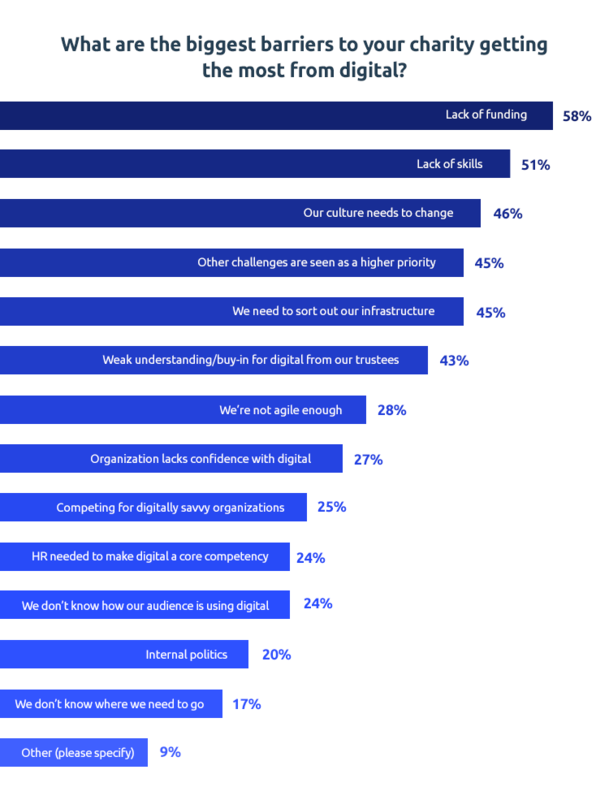 What’s more, almost half of charities interested in going digital are facing leadership obstacles, meaning that their management does not prioritize nonprofit marketing strategy. 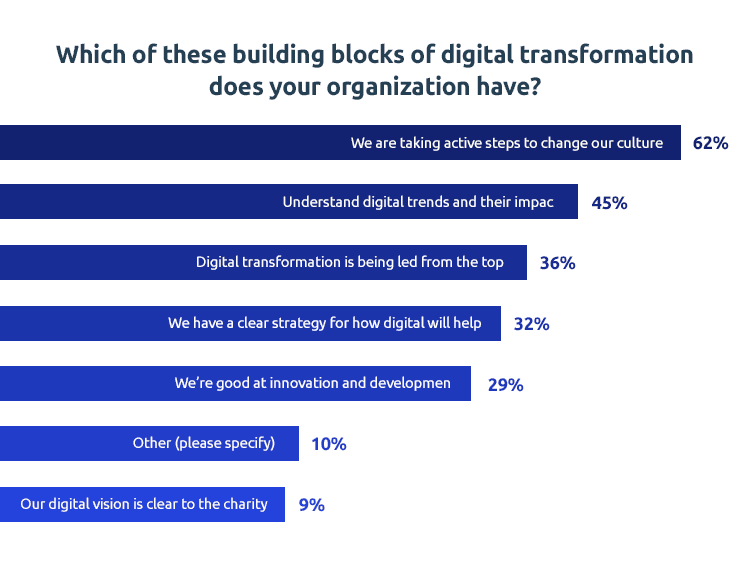 In fact, only in 36% of nonprofits is digital transformation being led from the top down. At the same time, organizations are acknowledging the potential impact of digital transformation within their culture. The good news is that staff can actually create content and run digital campaigns on their own, while gaining buy-in from leadership. This makes more sense for budget-conscious nonprofits as they can send team members to training or dedicate time to refining these skills without a huge financial investment. Acknowledging this challenge and using it as rationale for improving skills will pay off for your organization. Many worthwhile nonprofits exist, often in the same or similar spaces as your own. This can make the competition for donations difficult. Combined with this fact is potential cynicism from the general public, driven by organizations who mismanage funds or high-profile news stories that encourage distrust of nonprofits. If it makes sense, you can try to combat this mindset by encouraging transparency across the organization. Release your year-end reports in a major way, making sure to thank donors and let them know exactly how their dollars were spent. You can read more on this topic in the marketing plan for securing donations below. Similarly, you’re also facing competition from larger, well-known nonprofits that often get thought of first when a particular issue arises. Of course, working to advance your mission is good no matter what. But you still have goals to hit and objectives to solve. While many nonprofits do not have abundant financial resources, they have another great resource: a caring and passionate human force. Use your strengths to your advantage, and embark on a new marketing journey that helps you bring in donations, attract volunteers, and raise awareness for your biggest issues. Developing a marketing strategy for nonprofit organizations begins with finding existing resources and reaching out to the target audience with an important message. It may sound overwhelming to develop a nonprofit marketing strategy. However, the first step should always be to audit existing resources to see what’s available. You may discover marketing efforts to refresh or build upon. Here are strategies that help address each goal, using the marketing plan outline above. While the target of any nonprofit organization is raising awareness, attracting funding is no less important. These digital marketing tactics for nonprofits will help you do just that. Use A/B tests and PPC marketing with no investment whatsoever to boost your conversions and make sure you are really performing up to your potential with a digital strategy. PPC marketing is a paid marketing tool, but for nonprofits aiming to boost their digital footprint, Google Ad Grants program offers it free of charge. Actually, Microsoft and Google are some of the largest non-profit investors in the world. Together, they donate almost a billion of dollars annually. How does Google make money, you ask? The program limits some of the digital endeavors enjoyed by non-profits. For instance, a bid of $2 CPC and no more than $10,000 can be spent on digital nonprofit marketing monthly. For a free option, these numbers are still pretty attractive. Don’t forget about A/B testing. The concept is as simple as it sounds: any time you can, test out two different options with one change. You can test two different subject lines in your email campaign and see which one performs better (brings in more email opens). This tells you something about your audience – what messaging they prefer, and what they are passionate about. Another example of A/B testing is testing titles or call-to-action button colors. You can apply this testing approach to most of your marketing efforts, so keep it in mind when you’re starting new campaigns. To move your mission and speak to people’s hearts, make signing up and volunteering easy and accessible. Here’s how to apply your marketing plan to your nonprofit if the priority is volunteer recruitment. While 88% of charity marketers realize that email and website are their top sources of traffic in terms of volunteers and donors, 47% of them are actually making money from email marketing. In addition to email marketing, there are many digital sources at play, such as search engine marketing (SEM) and social media traffic. Securing funding is great, as is finding volunteers. However, your marketing goal may sometimes be to raise awareness of an important issue and get people talking. Be warned: building buzz and engagement isn’t necessarily easier than the other two objectives. To do this, make sure you stress the importance of your work. Most people volunteer or donate after hearing new reports or seeing nonprofit campaigns around pollution, for example. Reminding people of current issues can encourage them to tell their friends, change behaviors, or sign up for more information. Social media is becoming more important for successful donation marketing strategies. In the past few years, donors who have shared their affiliated charities online have brought them about 35% of their income through networking. On average, every 5th share on social media will result in a donation! How can you make sure your not-for-profit marketing efforts do not get lost in the sea of worthwhile nonprofits? Follow the steps in this article, and measure your impact along the way. These simple steps are done by every digital business daily, and they provide accurate benchmarking for your nonprofit marketing strategy’s success. Last but not least, don’t be afraid to fail and start over with new and fresh ideas generated by your team. The best digital marketing players are not perfect, but they definitely know how to stand up after falling.